The last one before she turns ONE. My heart has been so conflicted lately with the idea she will be one, and a toddler now, it means an entire YEAR has gone by since she could be the first person to hear my heartbeat from inside of my belly, since we met that sweet face and since our life forever changed for the better. She’s saying more than just Mama and Dada now, she’s saying Alex (my sister’s name), sit, dog, Dora, cat, woof, juice, clap and so many other silly words! She’s running already and dances DAILY. Like 20 times daily! She loves singing all of a sudden, I’ll be driving and hear ‘lalalala!’ from the backseat and it makes my heart melt into puddles on the floorboard. So cool to see this from month to month. 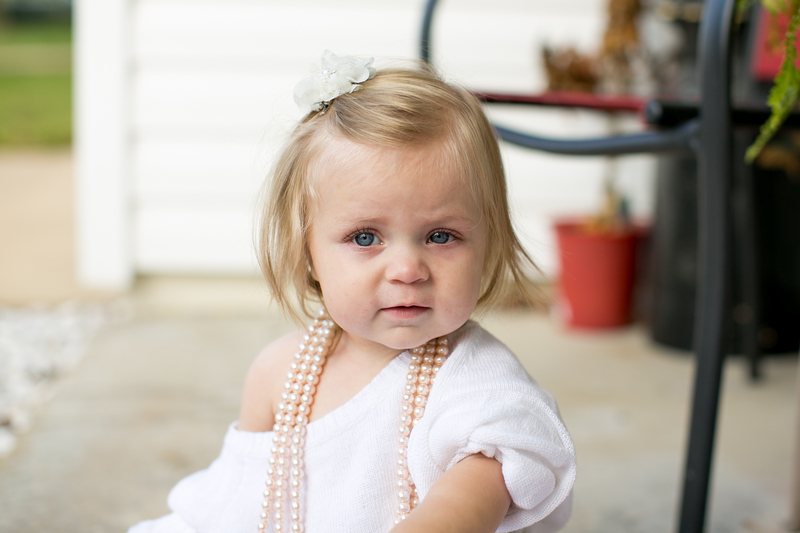 The last pic of the pearls reminds me of an angel! Amanda this is incredible! I hope you do this every year of her life. She’s gorgeous!